One of this year’s most anticipated exhibitions ‘The Credit Suisse Exhibition: Michelangelo & Sebastiano’ is now open at the National Gallery. We’re delighted to speak to Ellie, an art historian from View From The Gallery, about Michelangelo’s most famous paintings, where they were inspired from and why it is great to paint in Italy. Until the 25th June, the National Gallery in London is treating us to an exhibition that explores Michelangelo’s friendship with Sebastiano del Piombo and the ways in which these two artists influenced and collaborated with each other. The two men met in Rome in the early 1500s whilst Michelangelo was working on the Sistine Chapel for Pope Julius II. According to the gallery, Sebastiano was invited to view the chapel’s ceiling whilst the frescoes were in progress. It seems that having been exposed to such an impressive composition of twisted dynamic forms and strong colours, Sebastiano’s style altered significantly, focusing more heavily on complex human forms whose anatomical perfection share a certain resemblance with Michelangelo’s art. Michelangelo actually considered himself to be more of a sculptor than a painter. He needed a lot of persuading to agree to paint the Pope’s chapel in Rome despite it now being one of his most famous masterpieces sought out by tourists worldwide. 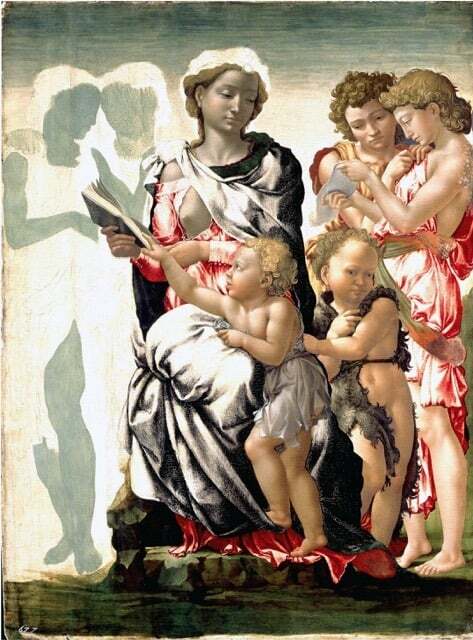 There is no doubt that Michelangelo’s treatment of the human form in his paintings is quite unique. If you look closely at his painting, you can tell he favoured sculpting over working with paint. The Manchester Madonna, one of the three Michelangelos owned by the National Gallery, is unfinished and gives a fascinating insight to the different layers he applied during the painting process. The figures have been blocked out in a dull green that lends a cold hue to their skin tones visible in the more complete members of the composition. This tonal quality, together with the smooth finish of the oil paint, makes the figures appear far more three dimensional and sculptural, almost computer graphic to the 21st century viewer. It seems that Michelangelo worked from right to left judging by the different stages of finish for each character within the composition. There could be many reasons to explain this, one being that he was left-handed and working in this was would avoid any smudging of the paint from his active, painting hand. Notice how the Virgin and Christ Child are arranged upon the rocks as if a sculpture on a plinth. 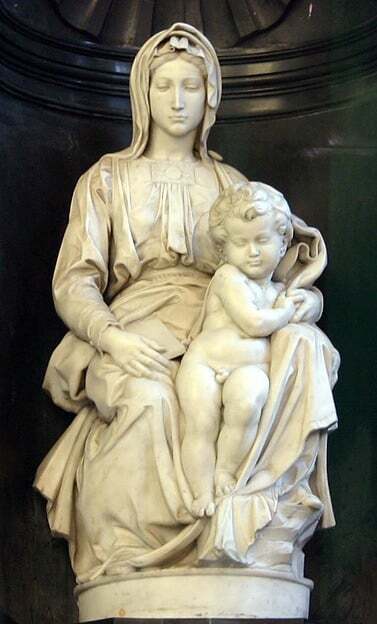 This may bring to mind his tender portrayal of the two in his Bruges Madonna – the only known sculpture by Michelangelo to have left Italy during his lifetime. The Virgin holds the scripture that contains the prophecy of her Holy child’s fate out of his reach, protecting him from learning his destiny despite his leaning for the book across her lap, his foot settled within the drapes of her mantle. This tender moment of maternal protection speaks volumes for the way a mother strives to protect her son but also to avoid the infant from damaging the precious book. It is both a human and divine moment, the most natural of movements that relate the two as mother and son as well as Holy Virgin and Christ the Saviour. The combination of Michelangelo’s devout Christianity and artistic genius brought about such tender and brilliantly executed artworks. Even when they’re halffinished. Sebastiano del Piombo was one of the first to learn from the Master and whose influence is worthy of a blockbuster exhibition in London. What better way to improve your own artistic skills but to go to the country where it all began, where the sun shines and the olive trees rustle, and study the art of painting, following in the footsteps of the great Michelangelo himself.